At first, Kurt Ove Eriksson thought it was a giant piece of plastic. After all, the 73-year-old man has been fishing for longer than most folks have been alive, and he’s seen just about everything. Except for course for the Giant Oarfish, AKA the king of herrings, an incredibly rare deep water fish last seen off the shores of Sweden over 130 years ago. Eriksson stumbled across his monster while returning home from a fishing trip in the waters off Bovallstrand, on Sweden’s west coast. 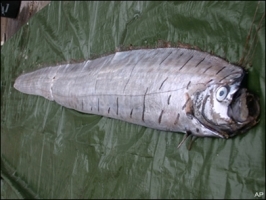 The Giant Oarfish is indeed a deep-water fish, the largest of the bony fish, and is capable of growing up to 36 feet long! Eriksson’s giant oarfish discovery was only 12 feet long, puny by oarfish standards. It is believed to be the fishy inspiration for a variety of sea monster legends. Eriksson handed the fish corpse over to The House of the Sea, an aquarium in Lysekil. They’ve yet to announce the date of the fish fry.